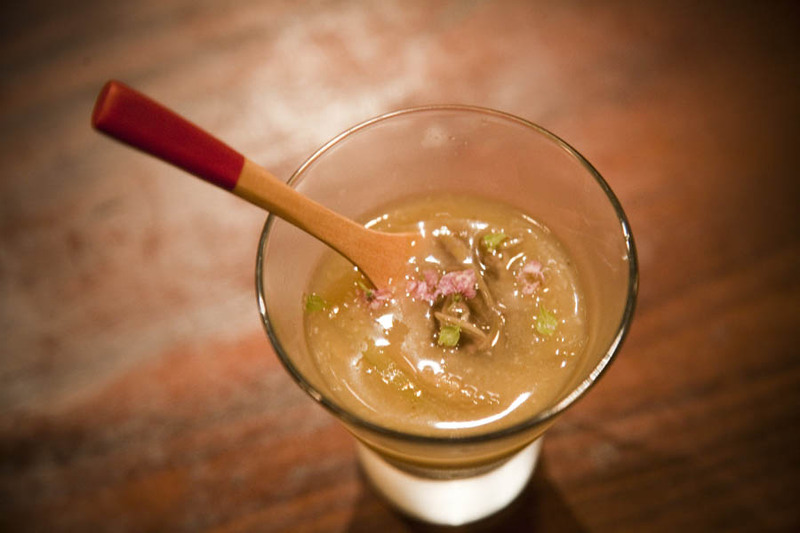 While in Japan, we tried to cover as many foods as possible. My favourite meal may have been Katsudon but in our effort to experience as many food types as possible during our trip, I stretched myself beyond pork perfection 😉 Which is why when we were in Kyoto and heard about a special 9-course tasting menu at Grotto that purported to be a tour of Japanese cuisine, we leapt at the opportunity to give it a try. Grotto is in Northern Higashiyama district, a quiet part of Kyoto rife with temples and shrines. 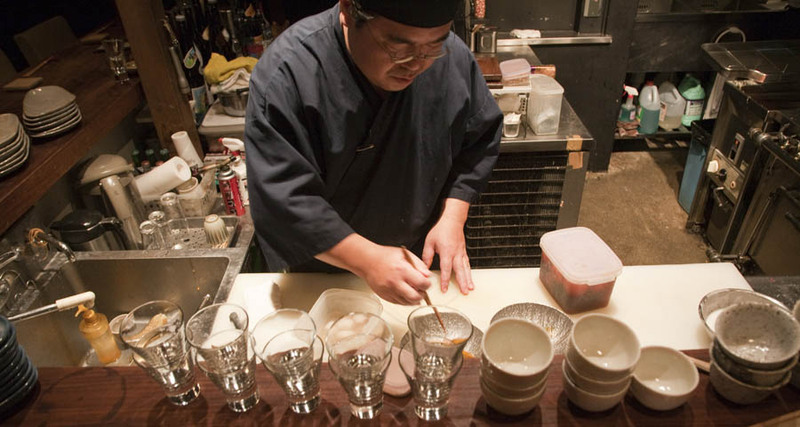 Mr. Tanaka, the chef, is from Kyoto but had extensive international training, having worked in both the US and Australia. 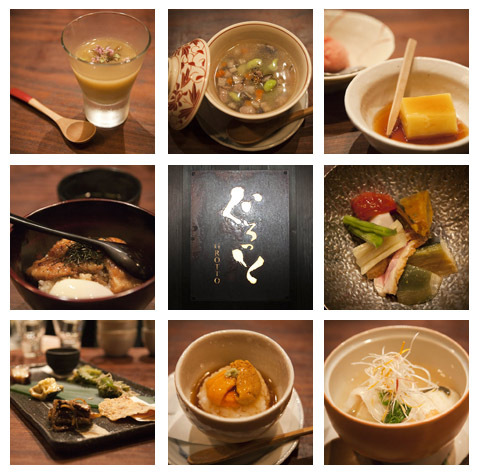 Returning to Kyoto in recent years, Mr. Tanaka strives to showcase local ingredients in the thoroughly Japanese tasting menu. 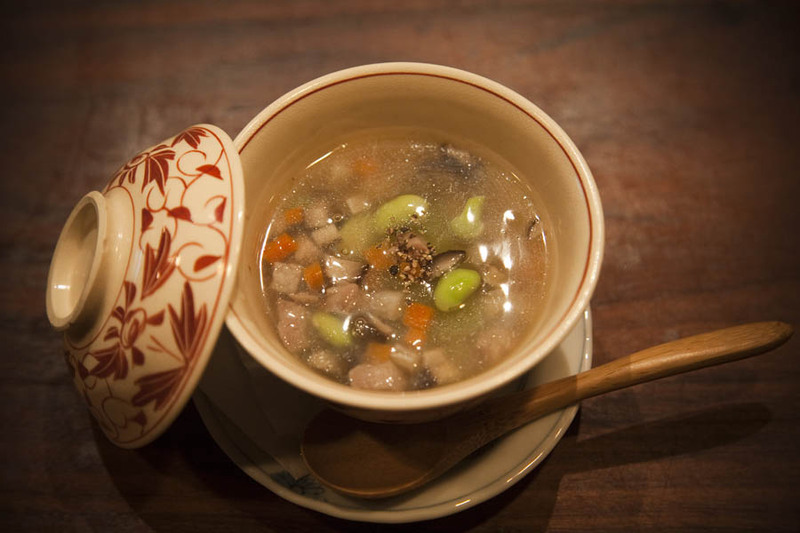 We sat at the bar and watched Mr Tanaka prepare each and every course for us…benefiting from his time abroad, we were able to inquire and learn a little about each dish (it is a real luxury to speak English with a chef in Japan). A light starter featuring rich smoky, grilled eggplant. This was a lovely stew of finely diced veggies and potatoes with the pork shoulder imparting a smoky flavour. I am not a sushi expert being new to the cuisine, but Paul tells me the sushi in Japan ruined him for sushi elsewhere in the world. 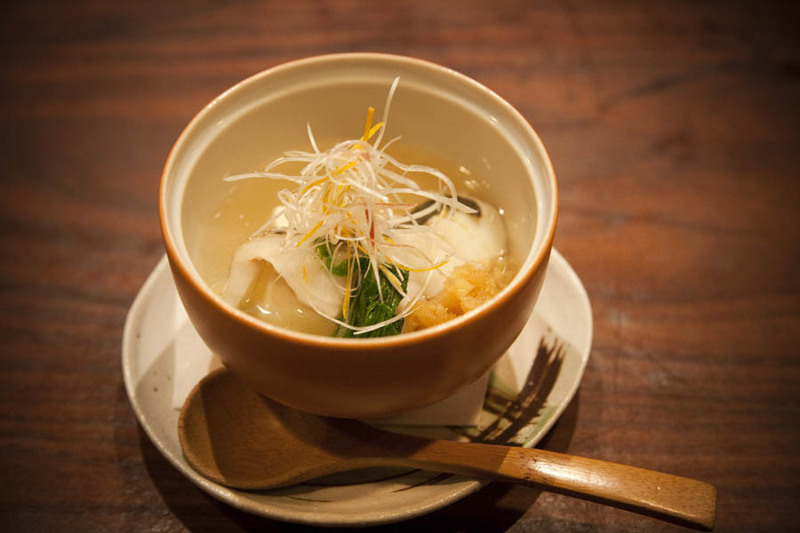 In a broth thickened with cornstarch, the delicate flavours of seabass and tofu mingle. 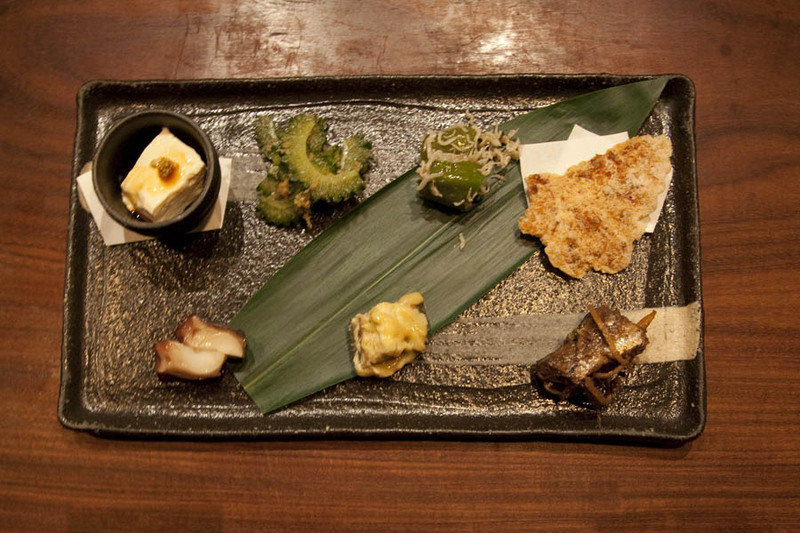 Including soy milk skin, bitter cucumber with bonito flakes, Japanese green pepper with baby fish, shrimp cracker, sardines with ginger, eggplant with mustard sauce and steamed octopus. My favourite, to my surprise, were the sardines…I tasted them begrudgingly as this is not a fish I typically enjoy, and was truly surprised how light the flavour was (rather than intensely fishy) and how dense and satisfying the texture was. 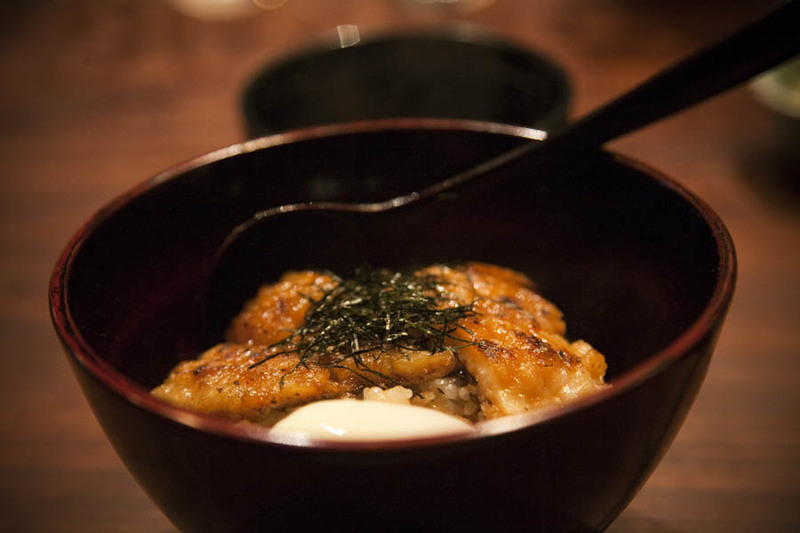 We found the sea urchin to be mushy and gritty…tasting like a mouthful of sea mud. Not a highlight of this meal. 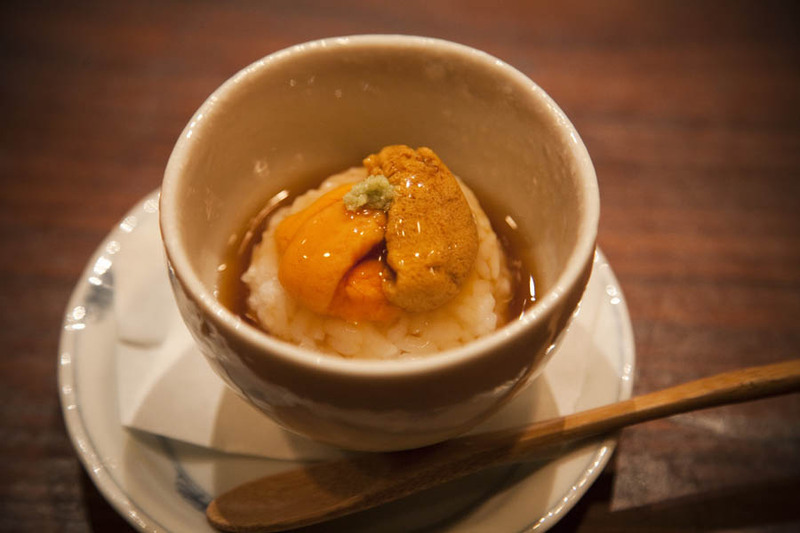 We were prepared to write off sea urchin until Paul had it again at Tsukiji and its honor was redeemed. 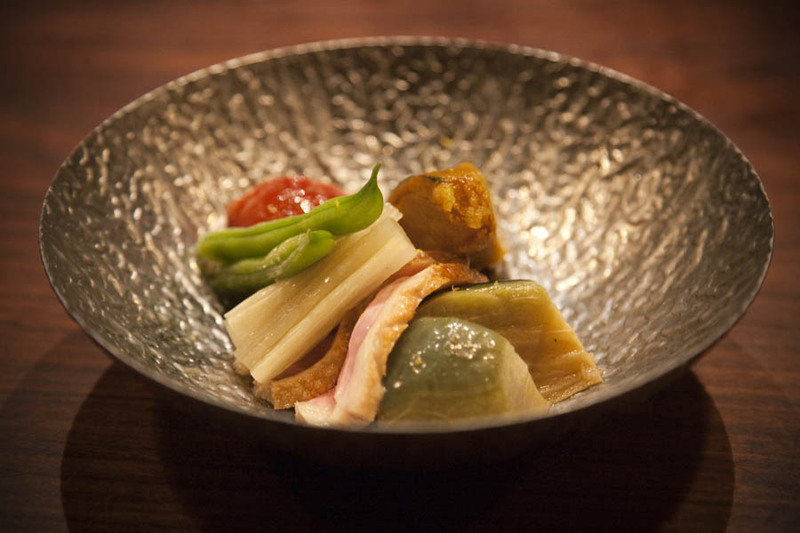 A medley of cooked veggies served cold, including eggplant, tomato, pumpkin, potato and topped with a slice of goose. 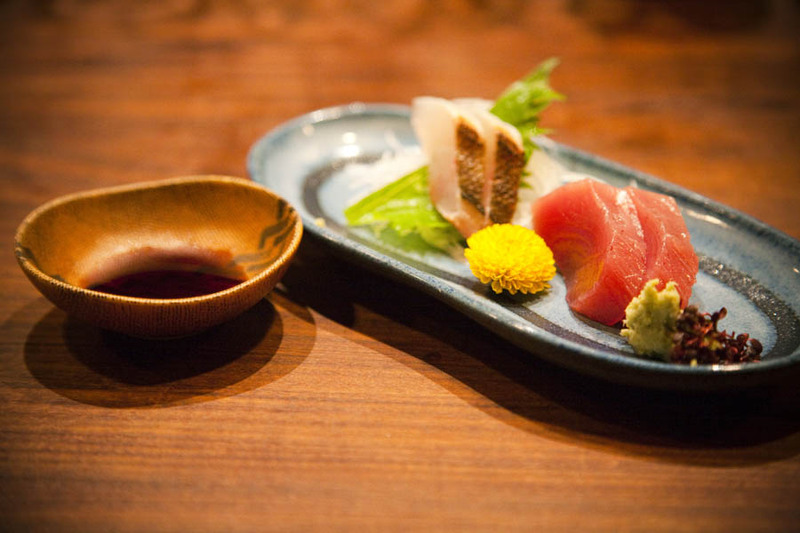 Mr. Tanaka explained the fish was local to Kyoto and was a bit like eel in its taste profile. Dessert was light and refreshing. 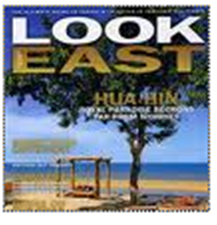 Overall, all the dishes were small in size with the emphasis on perfect mouthfuls of flavours. As a result, we left full but not overstuffed. 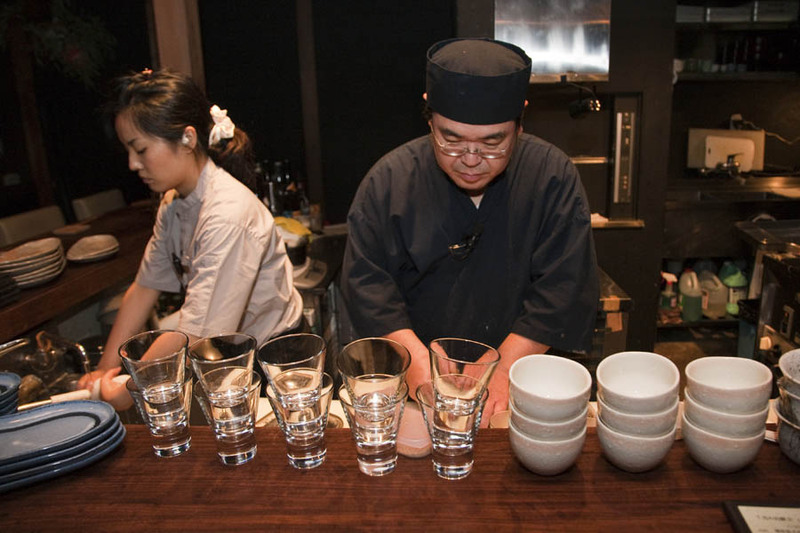 I think what I appreciated the most was sitting at the bar and watching Mr. Tanaka prepare the dishes. Remarkably, much of it was prepared in advance with the cooked vegetables and fish coming from the refrigerator already prepped and ready to be assembled. 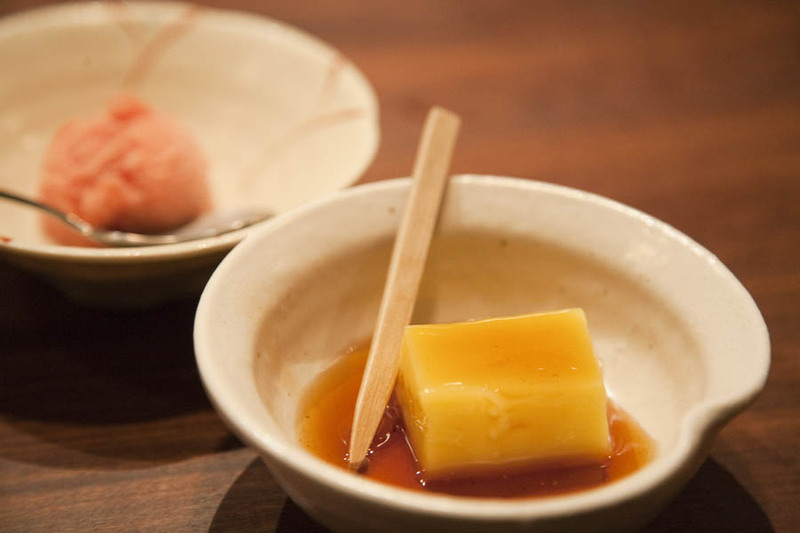 However, there is something really special and unique about Japanese presentation of food…how it looks is as important as how it tastes and is an art form in and of itself. 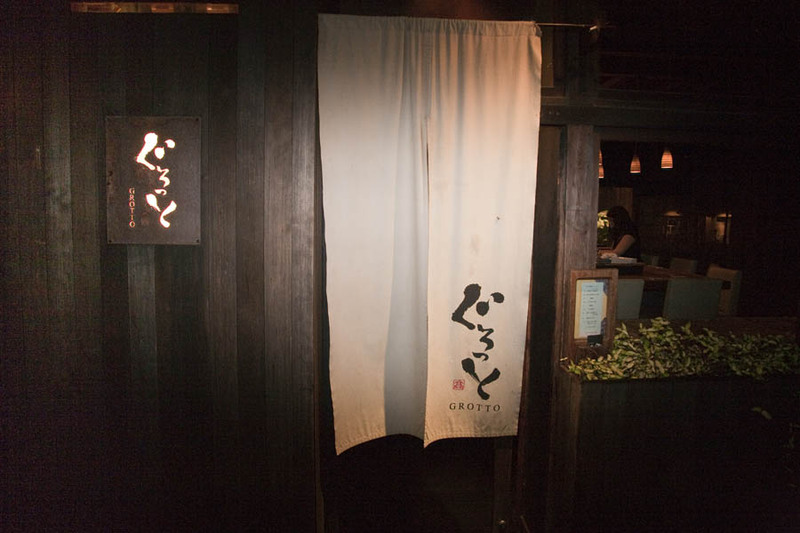 If you do try Grotto, please leave yourself plenty of time, as making one’s way through the tasting menu can take 2-3 hours.